If you're hitting the gym to enhance your Bicep Curls, like professional weightlifters, it's imperative that you isolate your arms and shoulders, while keeping back and elbows locked in position for curling exercise. Our Arm Blaster offers a secure fit for anyone looking to enhance and boosting their bicep curls and building routines with proper form and better leverage. ★Isolates your arms and shoulders while you perform curls. ★One Size Fits All, contours to your body shape. 【THE BEST CHOICE FOR YOU】An innovative way to strengthen and isolate biceps and triceps to perform muscle ripping curls.You can feel the extra stress and improved form on bicep curls. 【MORE EFFECTIVE FOR WORKOUT】Our arm curl blaster makes maintaining correct technique easier and as such the workout is more effective.It keeps elbows locked closer to the body to avoid swaying,which forces your biceps to do all the work.Contoured plate isolates arms and shoulders while keeping back and elbows locked in position for curling exercise. 【PREMIUM MATERIAL】Our bicep bomber is made of top quality lightweight aluminum without screws for biceps and triceps curls isolator.This will not bend as it is made of thick gauge aluminum. 【MORE COMFORTABLE AND STABLE】This new tough bicep curl support now has a padded abdomen region in addition to elbow and neck pads for comfort and stability. 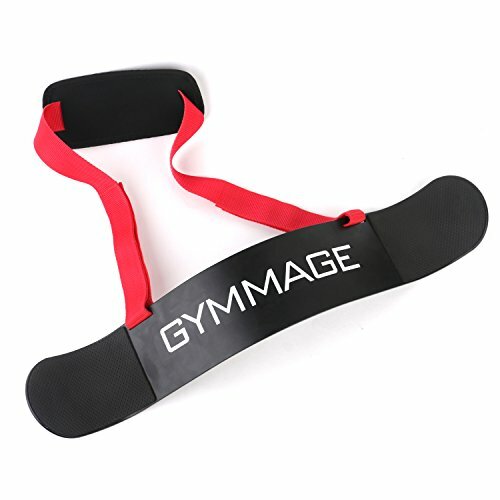 【WARRANTY】Every GYMMAGE product includes 18-month warranty.Please buy with confidence and don't hesitate to contact us if having any question,we'll get to you within 24 hours. If you have any questions about this product by GYMMAGE, contact us by completing and submitting the form below. If you are looking for a specif part number, please include it with your message.